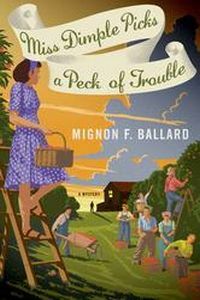 Miss Dimple Picks a Peck of Trouble by Mignon F. Ballard: Synopsis and Online Purchase Options. Synopsis (from the publisher): It's the summer of 1944 and the world seems mired in a war that will never end. On the home front, the people of Elderberry, Georgia, are doing everything they can to support the troops. Even with a war on, the peaches are ripe for picking. As veteran teacher Miss Dimple Kilpatrick and her colleagues work in the orchard, they hear frantic calls for help: An eighteen-year-old girl, Prentice, has been missing — and is later found murdered. Miss Dimple and her fellow teachers-turned-sleuths are determined to find the killer. Although Prentice had recently broken up with her boyfriend, the most obvious suspect isn't always the right one: Prentice may have been keeping some secrets; and a local woman claims to have witnessed the whole abduction — except she also believes she is Scarlett O'Hara, that Nazi spies are pursuing her, and that she knows where the Confederate gold is buried. Figuring out what really happened to Prentice is sure to be a challenge. But Miss Dimple, who has taught the town's first graders for decades, has never been daunted by a challenge.